Of all the phonographs offered by Edison, the Gem was the smallest and least expensive machine and, unlike other models, it was housed in an all-metal case. 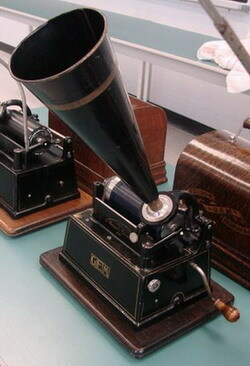 Introduced in February, 1899, the Gem was designed to compete with other small inexpensive phonographs, such as the Columbia model "Q" which was priced at a very attractive $5.00. 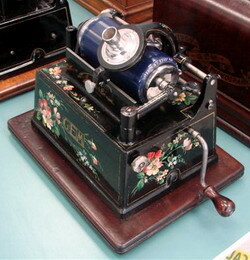 The Gem was the lowest priced machine manufactured by Edison and sold initially for $7.50. 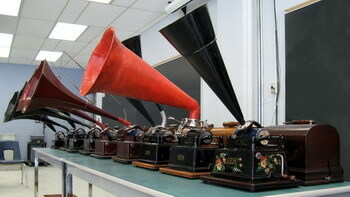 Edison had produced a few other models prior to the Gem phonograph. The first model marketed was sold as the Class "M", which was introduced in 1889. Originally sold for business use, it was modified in 1893 to be sold for domestic use at a price of $200.00. This model was later modified and re-named the Triumph model. 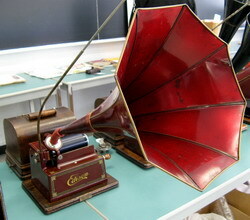 The second Edison model (called the Amet Motor phonograph) was introduced in 1895. It was eventually replaced by the Spring Motor phonograph, which was introduced in late 1897 or early 1898, at a price of $100.00. Edison, realizing the need to provide a more moderately priced machine for domestic use, next introduced the "Home" model in 1895. 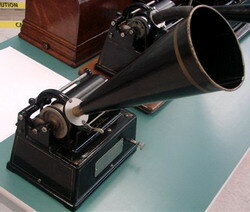 The earliest Home model, known as the Edison Clockwork Phonograph, was followed quickly in 1896 by the model "A" Home. The model "A" Home is usually referred to as the "Suitcase" Home and sold for a more accessible $40.00. In 1898, in a continual effort to compete with lower priced phonographs on the market, the Edison Standard Model "S" (which collectors refer to as the square-top Standard) was introduced at a price of $20.00. Many of the Edison phonographs of this era were sold as package deals, which may have included accessories along with one or two dozen cylinders plus a horn. In order to stimulate demand, both Edison and Columbia would advertise a new phonograph model for as long as one or two years prior to its being available to the public. With the introduction of the Edison Gem phonograph in 1899, Edison was able to compete with the lowest priced models on the market at the time. In total there were 5 models of the Gem, from the model "A", (which played only the two-minute cylinders), to the model "E" (which played only the four-minute cylinders). The model "A" Gem sold for approximately two years before the next model came out. There were many variants in the Gem line, especially in the model "A", which endured about 29 minor variations, including type of reproducer, attachments, decorations, gearing, horns, speed controls and so on. To keep costs down, none of the Gem models ever had a spring barrel and therefore could not be wound while playing. Some of these Gem machines are very rare and collectable, not for the phonograph itself, but because of the attachments and/or decorations. Later models (which sold for $15.00) were offered with special finishes, but proved to be unpopular and thus are sought after for their scarcity. Buyers of Gems were also offered the option of upgrading to a mahogany case and matching painted horn for $19.00. Specially decorated Gems seemed to be even less popular, with few buyers paying the additional $4.00 for decorations and fewer still opting for nickel plating at $15.00 extra. Those who wanted only the best for their modest little machine had the option to purchase top-of-the-line gold plating for an additional $25.00. Being so expensive, very few were sold with these extras. The model "A" Gem was introduced in February, 1899. This Gem, which played the two-minute cylinders, was offered with a camelhair brush and an oil can. The reproducer was fixed onto to the carrier arm and was held there by two screws. This apparatus has the weight and stylus of an automatic reproducer, but it can not be easily removed. No wooden case was provided with this model, but other manufacturers began offering wooden cases for the Gem for $2.50. With no wooden base on the machine, a metal drip-pan was fastened to the underside to catch dripping oil from the various gears. This Gem is known by collectors as the "Drip Pan" Gem. The speed control is at the front and is similar to ones used later by Columbia on their disc machines. The "A" is wound clockwise and, as it does not have a spring barrel, it can not be wound while playing. This machine sold for $7.50. The "Branded" case model "A" was introduced in 1901, had a branded decal on the wooden lid and a wooden base was also provided. This model played two-minute cylinders and had a speed control which had been relocated to the left side of the machine. The model "B" was introduced in November, 1905. Similar to the late model "A" with some variations, the winding key was replaced by a crank and the motor was moved to the left side of the machine to allow room for the crank. This model Gem was wound clockwise and played 2-minute cylinders. 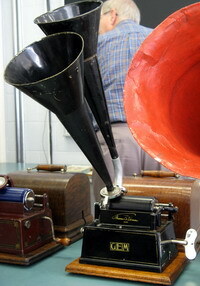 A cone horn was included, until 1907, when an eight-panelled horn was available and a model "C" reproducer was provided. This machine sold for $10.00 with a cone horn and for $12.00 with the panelled horn. The model "C" was introduced February, 1908. This two-minute Gem was similar to the model "B" but without the swing-arm, which held the end of the mandrel. This machine sold for $12.50. With the arrival of the four-minute wax Amberol cylinders in 1908, owners of Gems had to wait until July of 1909 to be able to purchase the combination attachments required to convert model "A", "B" and "C" Gems to play the new cylinders. This four-minute attachment, with the model "H" reproducer, sold for $4.15. In February, 1910, a special model "C" Gem was advertised with the International Correspondence School outfit, taking the place of the Edison Standard phonograph, which had been used up to this point. The outfit also included a 10-inch horn, listening tubes, oil can and 25 conversational records with instruction papers for four languages, all for a price of $35.00. The model "D" was introduced in October, 1909. This is the first Gem model designed to play both the two- and four-minute cylinders. Otherwise, the "D" resembled the models "B" and "C", although the spring was strengthened to improve performance and duration. This machine was finished in a maroon colour with the Edison signature decal replacing the familiar Gem decal, which had been used on all previous models. This Gem also included an eight-panel maroon horn and a model "K" reproducer. It sold for $15.00. In October, 1911, with the sale of the attachments being slow and most of the Gem machines still not converted to play 4-minute cylinders, the Edison company decided to reduce the cost of all the attachments and reproducers. In 1912, the model "E" Gem, which played only the four-minute cylinders, was introduced. Very similar to the model "D", the machine and the horn were finished in maroon. Unlike the model "D" though, the maroon paint was applied over black paint. The result was that the maroon color was not the same shade as on the model "D". The carrier arm also had a larger opening for the reproducer, so it could fit the model "N" reproducer which used a four-minute stylus. This version sold for $15.00. In July 1913, the Gem combination attachment outfit was introduced, which included ten special Blue Amberol cylinders, a model "N" reproducer and special carrier arm, at $4.75. In October, 1913, it was announced that with the exception of the school model phonograph, all outside-horn phonograph production would be discontinued. Sales figures show that some final Gems were assembled at the West Orange plant up to early 1914. This Gem has a Polyphone attachment with two black funnel horns. The Polyphone attachments were offered by the Talking Machine Company of Chicago in late 1898. The contraption has two reproducers, each with two sapphires that are about a 1/2 inch apart and that follow each other in the same groove. This creates an echo effect, providing a sound similar to a concert hall, along with increased volume. These attachments were offered for the Gem (and for most of the Edison cylinder player models including, the Standard, Home and Spring Motor) for $15.00 which included two 14" brass horns, or a concert version which cost $25.00 with two 24” brass horns. This Gem has a Bettini attachment with an original Bettini papier-maché horn. Bettini was an Italian engineer who immigrated to New York City in the 1880s. Bettini, having an interest in opera and sound recording, thought he could improve the quality of the recorders and reproducers in use at the time. After extended research, he was able to develop a much better reproducer, which he named "The Bettini Micro Reproducer". With special Bettini horns and carrier arms, these attachments were made for most of the Edison cylinder phonograph models and for a few Graphophones. He later moved to Paris, France, where he set up a lab producing cylinder phonographs and also began recording his own cylinders. In addition, Bettini manufactured three models of disc-playing machines. This is a very rare Edison Gem. It is believed to be the only decorated Gem ever found and it may be the only one to have survived over the last one hundred years. It has a mahogany banner case in addition to having the optional "flower decorations". This Gem model sold for $12.00, the optional mahogany case cost an additional $10.00, while the flower decorations and gold stripes added a further $8.00 to the cost. It was very unusual for someone to order such options on a low priced phonograph.